Yes, under all the clutter is my worktable. No, it has not dropped a bomb, nor have I pulled out every equipment I own. I have just been really bad clearing away equipment before I took on new things. *Cleaning my work table, - 30 minutes. *Illustration to text from Eirik - a bit stuck. *Postcard swap, 10 postcards, iHanna - Not started, deadline 12th of March! *Marionetts, learning to make some dolls, 400 hours. - about 70 hours into the project. *Educational illustration - almost done, about 4hours left. *Carving a stamp/linoleum - just the fine tuning and printing/stamping. *Install shelves in the studio - not sure of the hours, 6 racks, 3 done. *Moly_x, - one journal entry every month. *Rakels picture, - adding text and varnishes, deadline 1.may. *Art journal - 15 minutes everyday. *Blog, somewhere in my head there is a connection between what I know I would love to share, and finding the moments to put my self down and typing it up in English. *Editing the videos that I have filmed. *Make 10 ATC and find someone to swap them with! *Sample book, making an overview of the techniques I know. *Ballerina painting, - adding the detail and shadows in the dress + varnishes, deadline 1. august. *Geo Caching, need some fresh air. I think that's it. You know anything I forgotten? Wow! You have a very full schedule over the next few months!!!!! 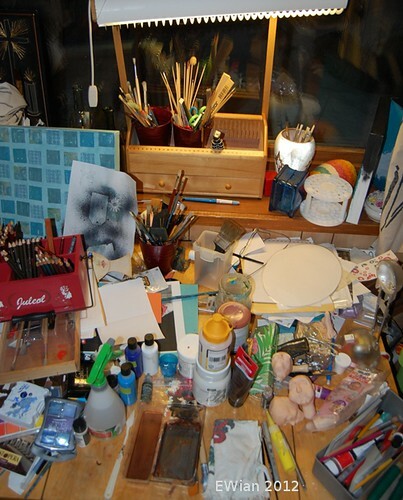 As for the cluttered studio...I can so relate. I am bad about putting things away when I work on projects too!! Sigh! !